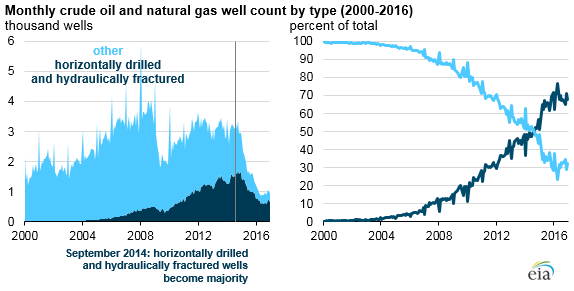 The practice of horizontal drilling and fracturing shale formations for oil and gas began growing in the U.S. in the early 2000s. In September of 2014, this practice surpassed traditional methods and became the primary way companies produced energy. In this process, after a well is drilled, a frac crew pumps high volumes of a mixture called proppant into the well. Proppant is a blend of sand, water, and additives designed to expand fractures in the shale. After fracking the formation, a temorary plug is installed. The plug will be opened when the construction crew has installed the flowback equipment and the flowback operators are on site and the well will be opened to flowback production. When a shale well first comes on, “flowback” is the first thing that returns. Flowback generally consists of a mixture of sand, crude oil, natural gas, and water. A flowback operator’s job is to manage a well’s production during the first period of production, until the sand is relatively stable and the well is producing mostly oil and gas. One such operator is Adam Verret. Originally from a small town in South Louisiana—with a distinct Cajun-tinged accent to prove it—Adam Verrett has been chasing oil and gas jobs for the last 19 years. He’s currently a flowback operator working in the STACK in Oklahoma’s Woodford Shale. Adam has worked in the Eagleford in South Texas, the Utica and Marcellus in Ohio, and the Haynesville in Louisiana. Living in a trailer on site, Adam works twelve-hour shifts seven days a week, rain or shine. And the well doesn’t stop for weekends, sick days, or holidays. “I haven’t seen a Christmas tree in four years,” he says. The well site is approximately the size of a football field. At the center of it is the wellbore, out of which rises a wellhead, also called a “Christmas tree.” This is the piping, valves, and fittings connected to the top of a well that direct and control the flow. Around the wellhead orbit the various vessels and equipment that separate the formation fluid into disposal, recycle, and sales routes. Flowback can be a very volatile period in production. Flowback operators specialize in managing this period, troubleshooting, and keeping everything flowing. It can take anywhere between 30 and 120 days for a well to clean up and the flowback operator to move on. Adam’s alarm wakes him up at 3:00 a.m. After a quick coffee, he steps out of his on-site trailer to catch up with the overnight operator before his shift officially starts at 4:00 a.m.
Every hour he walks around the site, his boots crunching gravel, and checks his flow computers. He records the numbers in his tally book, to be typed into a spreadsheet later. This will give him a picture of what the well is flowing and how it’s changing. Sand can settle quickly on bottom of the separators and in the piping. To prevent clogging, Adam opens and checks dump valves regularly, and if needed he clears them out. When his shift ends at 4:00 p.m., he heads to his trailer to check his numbers and make sure everything balances out. His final report is due every day at 5:30 p.m.
Adam says a lot has changed in oil and gas production since he got his start in 1999. For example, it hasn’t always involved spreadsheets and flow computers. With modern monitoring equipment, production companies can see what a well is flowing without the Bartons. Adam says things are certainly much safer now. On one of the separators in Adam’s field, a message reads: “Been fighting this thing all night!” It’s scrawled in white chalk just above a trunnion assembly of a liquid level control system. A few days prior, Adam had been working to weight his float, but any change he made didn’t seem to get the float to interfacing correctly. The last thing he wanted to do was shut in the separator and re-weight it. Adam made a few calls about the dump valve, but was still having trouble. So he went online to see if there were any videos. He ran into one of Kimray’s. Working in flowback since 2012, Adam has learned a lot about both the art and science of flowback operations. Adam also advises those interested in making a career out of it to count the cost of the lifestyle. On day 17 since turning on the well, production seemed to be steadying. Trucks were coming in multiple times a day to pump water and oil from the tank battery. Three frac tanks had left the day before and now only one remained. Adam knows his line of work is not for everyone. But it is for some. Those dedicated few who pull energy out of the ground for the world to run on. While Adam won’t be home this Christmas, his wife and son are coming to join him.